A delicious appetizer recipe full of cheese, bacon, and lots of flavor. 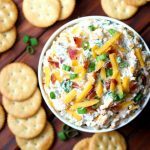 This Million Dollar Dip – also knows as the best dip ever – is easy to make and sure to be a crowd pleaser! Add cream cheese, sour cream, shredded cheese, bacon bits, slivered almonds, and green onions to small bowl. Mix until well combined.